Roughly based on similar markets in London, Berlin and New York - you'll find Melbourne's best art and design talent here each Saturday and Sunday. In fact, we showcase the work of up to 120 creatives, so expect to feast your eyes on plenty of unique gems and one-off wonders that you won't get anywhere else! Find everything from quirky furniture design and stunning fashion through to intricate jewellery and unique paintings. So if you're a lover of all things handmade then look no further. Come along and experience it for yourself. Celebrating 15 years of handmade! The Rose St. Artists' Market is situated at 60 Rose Street, Fitzroy in between Brunswick and Nicholson Streets. The market is close to shops, galleries and public transport. From the city, catch tram 96 from Bourke Street (get off at stop 16) or tram 11 from Collins Street (get off at stop 17). If travelling by car, there is an all day car park on Rose Street (20m from market entrance). The Rose St. Artists' Market is open each Sat and Sun from 10am until 4pm. Been busy making? The Rose St. Artists’ Market is always on the lookout for talented artists and designers to join our community. It's heaps of fun and a great way to fill the piggy bank. You'll meet other makers and get your product in front of customers who love all things handmade! Join us for an exciting pop-up Mother’s Day Market in the city! We’ll set up shop at St. James with a great selection of art, design, performance and all round good times for every mum! Find us at the undercover promenade from 10am-3pm. Now is the time to apply to get involved for our Autumn season! It’s a great time to join our community and start showcasing your work here. Enjoy creative and colourful market stalls showcasing a variety of home baked sweets, cakes, pastries, tasty treats and artisanal produce. Stay up to date with all the latest market news and events. Shopped up a hunger? Grab a bite at the market eatery - Young Bloods Diner - complete with rooftop. And why not make a day of it and experience the culture, street art, galleries and sights that our home of Fitzroy has to offer! 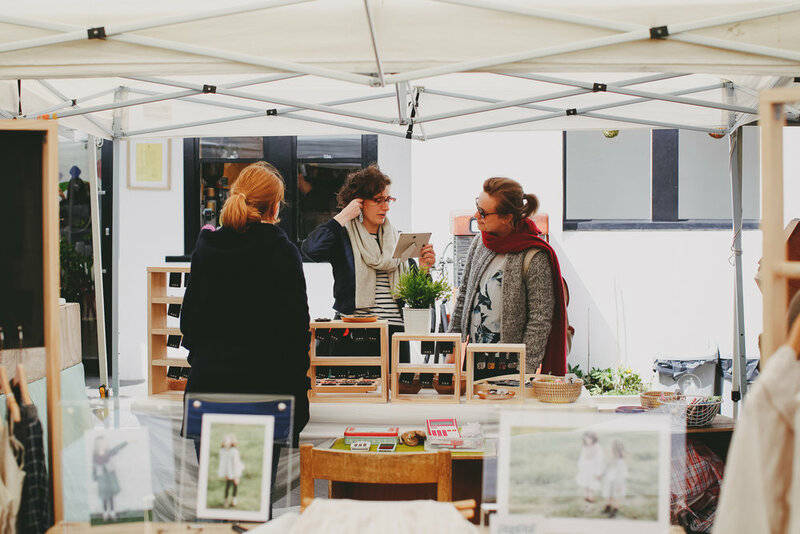 Check out our other great markets around Melbourne. Found in the bustling heart of the Frankston city centre, check out great design and tasty treats at twilight. On the third Saturday of each month (Summer only).